Blount..Rolled out of Da Burgh | "IT'S A STEELERS WORLD"! Once considered the most dangerous running back duo in the NFL, “Ring the Bell..Roll the Blount”..is no more. 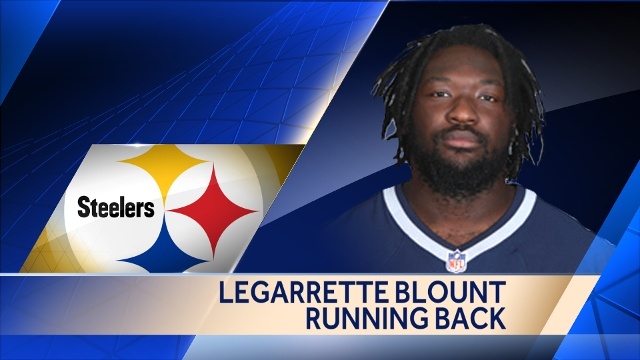 The Pittsburgh Steelers have cut ties with problematic and disgruntled running back, LeGarrate Blount this afternoon, from what head coach Mike Tomlin says was..”best for the Steelers”. Something I must admit I totally agree with. Since his arrival in the Steel City, Blount has run in with the law as well as Bell. But the difference between the two is, Bell knows what it takes to regroup and become a better teammate. Something leaving the field before a Steelers 27-23 victory over the Titans last night did not bode well for Blount. Which brings me to this message to #27..”YOU CANNOT BE UNPRODUCTIVE AND HAVE A CRAPPY ATTITUDE IN THE STEELERS ORGANIZATION”! A storied franchise that does not put up with insubordination whatsoever. until it is legal, no weed with the Steelers. Smoke your Blount somewhere else.